Get ready for Big Flock 2019! 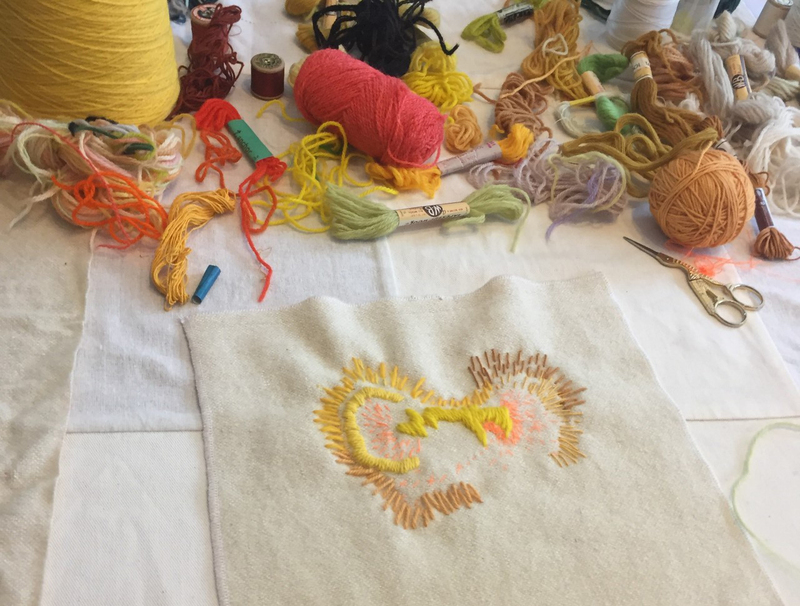 Last year’s flock was so wonderful, uplifting and energising and we had such lovely feedback from people who took part, that we’ve decided to make this an annual event. 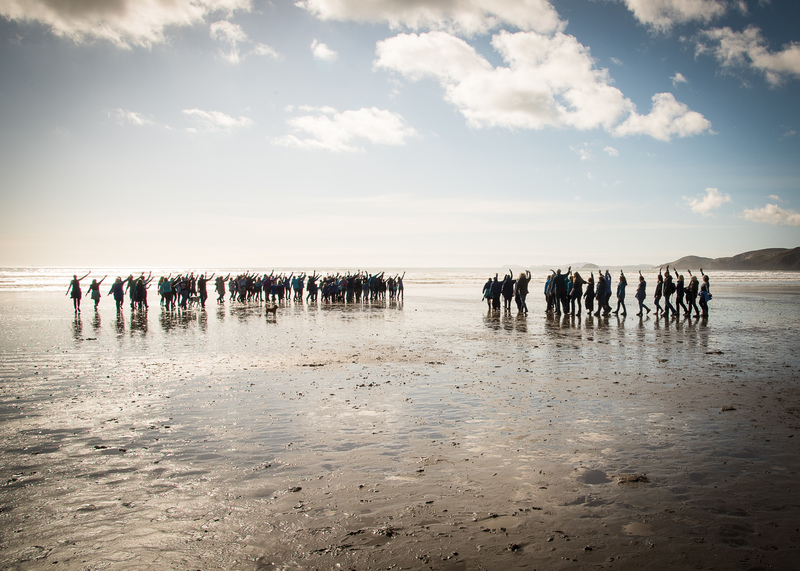 If you want to be part of this year’s flock, it’s on Thursday 25th April 4-5 pm Newgale Beach. It costs £2.50 per person, £1 of which goes to RSPB. Please book ahead, so we know how many people to expect. 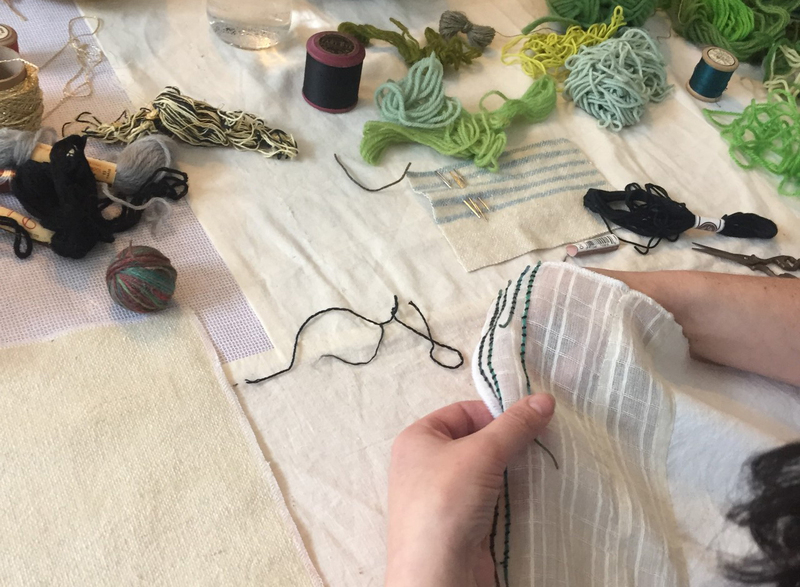 Collaborative Stitch, a responsive spontaneous stitch conversation hosted by textiles designer Jolette Le Roux and visual artist Ruth Jones is coming to Theatr Gwaun. The event is free but is limited to 10 people, so please book in advance. Watch the short video below for an idea of what we will be doing. It is fun, informal and relaxed. You don’t need to have any experience of sewing to come. The collaborative pieces that we make will become part of the S A M P L E collection to be reused and upcycled into something new at a later date. It may become part of a piece of clothing, or a piece of textiles sculpture….who knows? 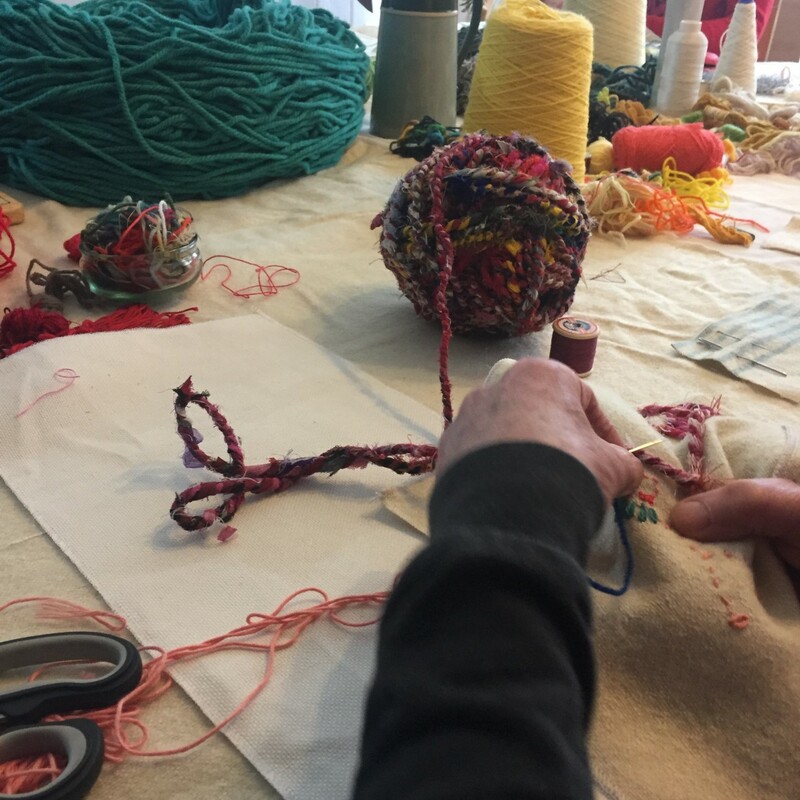 Collaborative Stitch is part of S A M P L E an exiting new Holy Hiatus project with a series of creative workshops and events, exploring colour, fibre, texture, light and sound. Over two years Holy Hiatus will be working with the community, local artists and designers, creating collaborative artworks for a multi sensory communal exhibition. 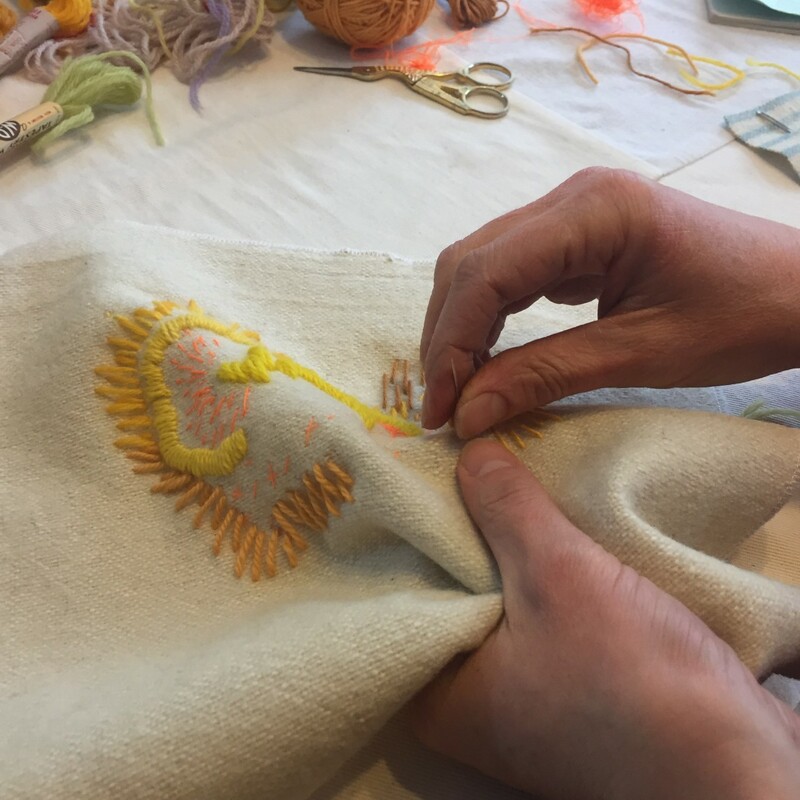 We’ve been having a lovely time with Collaborative Stitch! 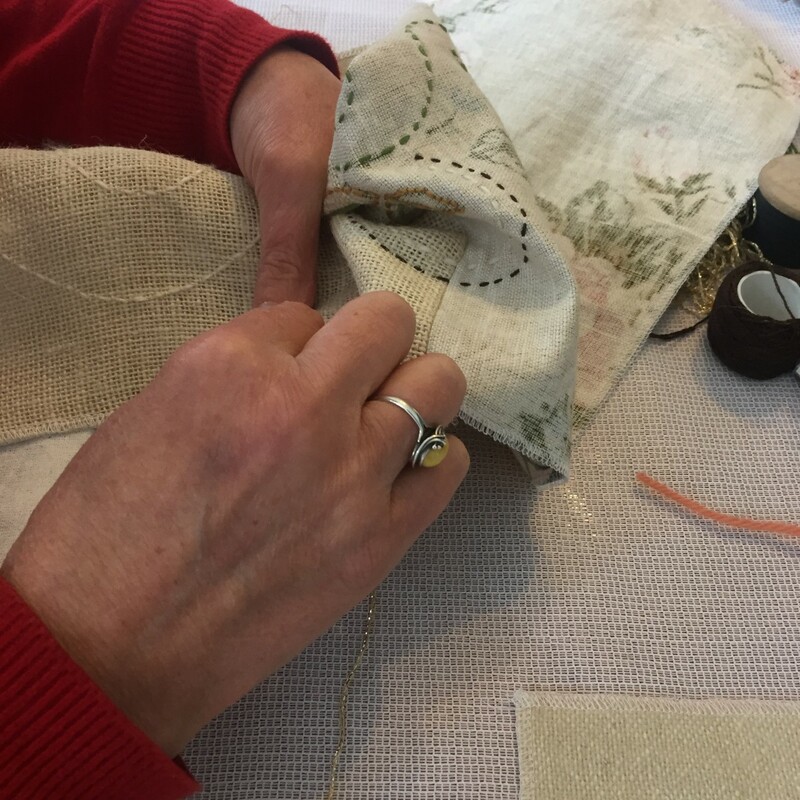 We’ve now held two Collaborative Stitch workshops and have another one planned for 9th March at Theatr Gwaun in Fishguard. More details to follow. 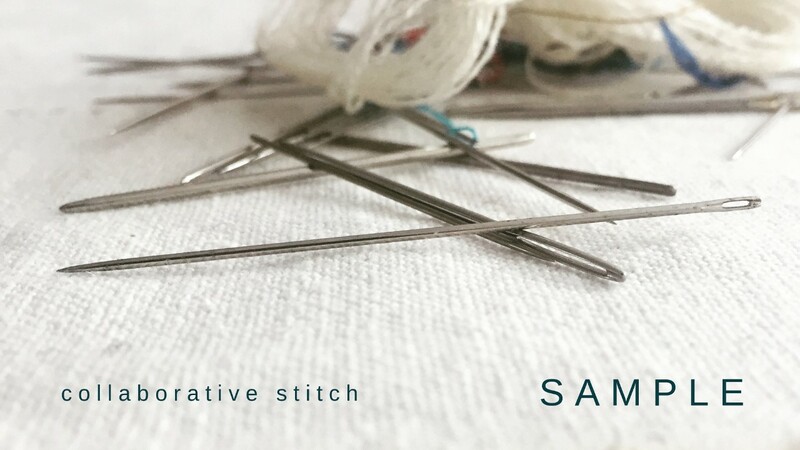 Join us on the 22nd of January 2019 for Holy Hiatus’s second S A M P L E workshop, Collaborative stitch 2, a responsive spontaneous stitch conversation. This is a free event, but please book as there are limited places. Donations are welcome to support the tea bar and cake. Please bring food to share. 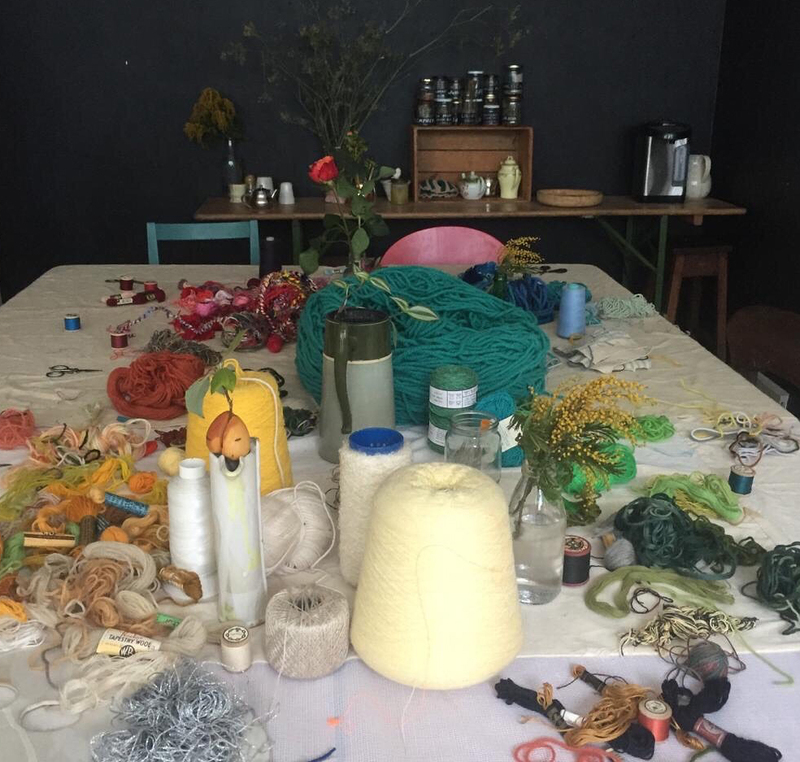 S A M P L E is an exiting new Holy Hiatus project with a series of creative workshops and events, exploring colour, fibre, texture, light and sound. Over two years Holy Hiatus will be working with the community , local artists and designers, creating collaborative artworks for a multi sensory communal exhibition. Imagine not thirty people but several hundred making a human murmuration on Newgale Beach! Come and join in, everyone welcome, all ages, all levels of mobility. There will be a flock that’s just the right speed for you. We will have some fun learning some simple movements and keeping in time with your flock. You must register for this event. It costs £2 per person, £1 of which goes to RSPB. Kim Rosen, M.F.A., has awakened listeners around the world to the power of poetry to heal and transform individuals and communities. 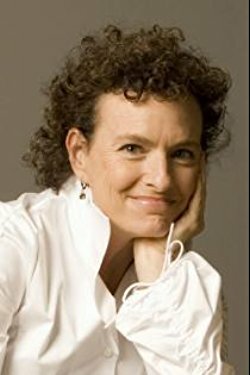 She is the author of Saved by a Poem: The Transformative Power of Words.Combining her devotion to poetry with her background in psychotherapy and spirituality, she offers lectures, workshops, retreats and Poetry Concerts all over the world. Hosted by Holy Hiatus, Kim will be offering a non-residential weekend workshop A Broken Hallelujah at Small World Theatre, Cardigan, west Wales from Thursday 28th June – Sunday 1st July 2018. This is currently her only UK teaching event in 2018. This was a collaboration between Holy Hiatus and Joon Dance. Plans are afoot for next years Gather / Casglu workshops, which will take place between Thursday 5th – Sunday 8th April 2018. Further details will be announced soon. As well as the half day workshops, we will be hosting The Big Flock on Newgale beach open to anyone of any age or ability. This will be a fun event for all the family, and will accommodate people with different levels of mobility through a number of smaller flocks of differing speeds, all of which will encounter one another and interact together on the sand. To get an idea of how this might be, watch the video below and imagine this taking place with a few hundred people! Old Ocky Whites Department Store, Riverside Market, Haverfordwest. This will be the first public screening of the new video installation Gather / Casglu by Ruth Jones with a soundtrack created by electronic composer by Andy Wheddon. Jones’s film work is characterised by rhythmic editing, and long slow shots that draw the viewer into a contemplation of place, patterns and presence. The film has been created from landscape imagery shot in Pembrokeshire combined with footage from the Holy Hiatus and Joon Dance collaborative project Gather / Casglu in April 2017 – a series of outdoor site-specific dance workshops exploring place and the movement of people and animals through the Pembrokeshire landscape led by professional dancers Zosia Jo, Sally Smithson, Gareth Chambers and Louiseanne Wong. Also showing will be the documentary film about how the dance and movement project evolved and the responses of those who took part. This was a truly multi-generational event in Solva, Newgale and Haverfordwest with participants from ages 4 – 79. 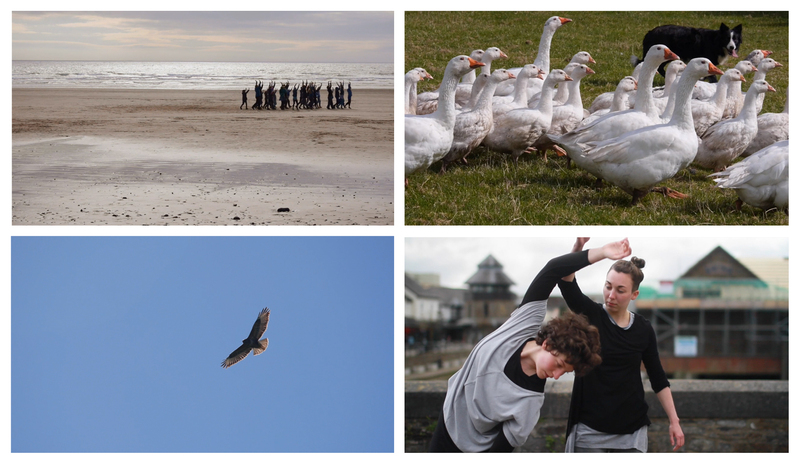 Gather is a collaborative Holy Hiatus project with Solva based dancer/choreographer Zosia Jo, director of Joon Dance, who will be working with professional dancers Sally Smithson and Gareth Chambers to create three on site dance workshops and informal performances for local people. We will be exploring the themes of “gather and flock” focusing on the interrelated, movement of humans and animals through landscape, for example, the way that cattle would have moved en masse along the drover’s roads, the murmurations of starlings, shoals of fish and schools of dolphins as well as the numerous ways that people gather or move together. Focusing less on individual performance, the dances will be choreographed to focus on how we move together as one. We will be celebrating through movement the relationships between humans, animals and the land in rural west Wales, deepening and highlighting our communal connection to the places we inhabit. Workshops will take place over three consecutive days in the three locations from 1.30-4.30 pm with an informal public performance from 4.30-5 pm each day. You will learn some unique movement techniques and new choreography developed by Zosia, Sally and Gareth. At the end of each workshop, the group will offer an informal performance on site, sharing what you have learnt that day with friends, family, local people and passers by. The workshops are open to anyone of any age interested in exploring movement in an inclusive, fun and engaging way. No dancing experience is necessary! Family groups are encouraged, and under 8’s are welcome if accompanied and supervised by an adult at all times. Joon Dance Company is dedicated to bringing professional dancers closer to communities. Zosia Jo believes that ‘everyone of any ability or age can learn to move in a satisfying way’. Please let us know about any disabilities, additional needs or movement difficulties prior to booking and we will endeavour to accommodate you. Prosiect Holy Hiatus yw Casglu ar y cyd â’r ddawnswraig/coreograffydd o Solfach Zosia Jo, cyfarwyddwraig Joon Dance, a fydd yn gweithio gyda’r dawnswyr proffesiynol Sally Smithson a Gareth Chambers i greu tri gweithdy dawns a pherfformiadau anffurfiol ar y safle i bobl leol. Byddwn yn archwilio themâu “casglu a phraidd” gan ganolbwyntio ar symudiadau cydgysylltiedig bodau dynol ac anifeiliaid trwy dirwedd, er enghraifft, y ffordd y byddai gwartheg wedi symud gyda’i gilydd ar hyd ffyrdd y porthmyn, murmuron y drudwy, heigiau o bysgod ac ysgolion o ddolffiniaid yn ogystal â’r ffyrdd niferus y mae pobl yn ymgasglu neu’n cydsymud. Bydd y dawnsiau, sy’n canolbwyntio llai ar berfformiadau unigol, yn cael eu coreograffu i ganolbwyntio ar y ffordd rydym yn cydsymud fel un. Byddwn yn dathlu trwy symud y berthynas rhwng bodau dynol, anifeiliaid a’r tir yng ngorllewin Cymru wledig, gan ddyfnhau a thynnu sylw at ein cysylltiad cymunedol â’r lleoedd rydym yn byw ynddynt. Bydd y gweithdai’n cael eu cynnal dros dridiau yn olynol yn y tri lleoliad o 1.30-4.30pm gyda pherfformiad cyhoeddus anffurfiol o 4.30-5pm bob dydd. Byddwch yn dysgu rhai technegau symud unigryw a choreograffi newydd a ddatblygwyd gan Zosia, Sally a Gareth. Ar ddiwedd pob gweithdy, bydd y grŵp yn cynnig perfformiad anffurfiol ar y safle, gan rannu’r hyn a ddysgwyd gennych y diwrnod hwnnw gyda ffrindiau, teulu, pobl leol a phobl sy’n mynd heibio. Mae’r gweithdai’n agored i unrhyw un o bob oedran sydd â diddordeb mewn archwilio symudiadau mewn ffordd gynhwysol, hwyl a difyr. Nid oes angen profiad o ddawnsio! Anogir grwpiau teuluol, mae croeso i blant dan 8 oed os oes ganddynt gwmni a goruchwyliaeth oedolyn bob amser. Mae’r Joon Dance Company yn ymroi i ddod â dawnswyr proffesiynol yn agosach at gymunedau. Cred Zosia Jo y gall ‘pawb o unrhyw allu neu oedran ddysgu symud mewn ffordd foddhaol’. Rhowch wybod i ni am unrhyw anableddau,anghenion ychwanegol neu anawsterau symud cyn cadw lle a byddwn yn gwneud ein gorau i ddarparu ar eich cyfer.